A lot has changed in the 30 years since Silverwood opened. Back then, downtown Coeur d’Alene was a busy but modest retail hub, and featured a newly minted Coeur d’Alene Resort. Population numbered around 20,000, climbing as people discovered the region’s lakes and lands, much of which lay undeveloped up Highway 95. Although the north-south freeway had been in existence since 1926, towns like Athol — a former mill town — barely registered on visitors’ radars. And then Gary Norton had an idea: turn the sleepy airport into a tourist attraction starring his Ford Tri-motor and other planes. He added a 1915 train engine, forming the foundation of Silverwood Theme Park and the rest, as they say, is history. When Silverwood opened on June 20, 1988, the park featured a few rides — the carnival type, but also Norton’s vintage railroad — a movie theater, and the quaint Victorian-style “main street” of shops which served as a backdrop for the rides. An estimated 120,000 people visited Silverwood that first year, a number that continues to rise. As attendance has increased, so have attractions: a log flume within two years of startup, followed by roller coasters — Thunder Canyon, Timber Terror and then Tremors — and Boulder Beach Water Park in 2003. More rides and features followed, nearly one per year — Panic Plunge in 2006, Scarywood in 2009, SpinCycle in 2013 — bringing the total number of rides to around 70. Silverwood has had a positive impact on the economy, employing 91 full-time employees plus 1,055 seasonal workers, many of them young adults gaining valuable skills. They’ve also brought visibility to nearby towns, which have benefited from increased services like the new full-convenience grocery store retail hardware store in Athol. As much change has occurred in the communities surrounding Silverwood’s 413 acres, a few things haven’t changed. “We are excited to be celebrating 30 years as the Pacific Northwest’s destination for fun,” says Carter. “Silverwood is a place where mom, dad, brother, sister, grandma, grandpa and everyone in between can come and create incredible family memories. From our humble beginnings as an Aerodrome in a remote area in North Idaho, to a destination serving over 680,000 guests annually, we are so grateful for the support we have received from our local community. A mighty display of horsepower takes over Coeur d’Alene this weekend. The pre-funk begins at Slate Creek Brewing (noon-6:30 pm) then see a bevy of classic cars from model T’s to flamed-out Ford Coupes on parade Friday from 6-9 pm or take a closer look at the Show & Shine from 8 am-4 pm on Saturday along Front Avenue, between Third and Sixth, and on Sherman Avenue. An Elvis Tribute concert at McKuen Park (tickets $20) at 2 pm adds to the fun. Call 208-415-0116 for concert tickets or visitcda.org for more details. 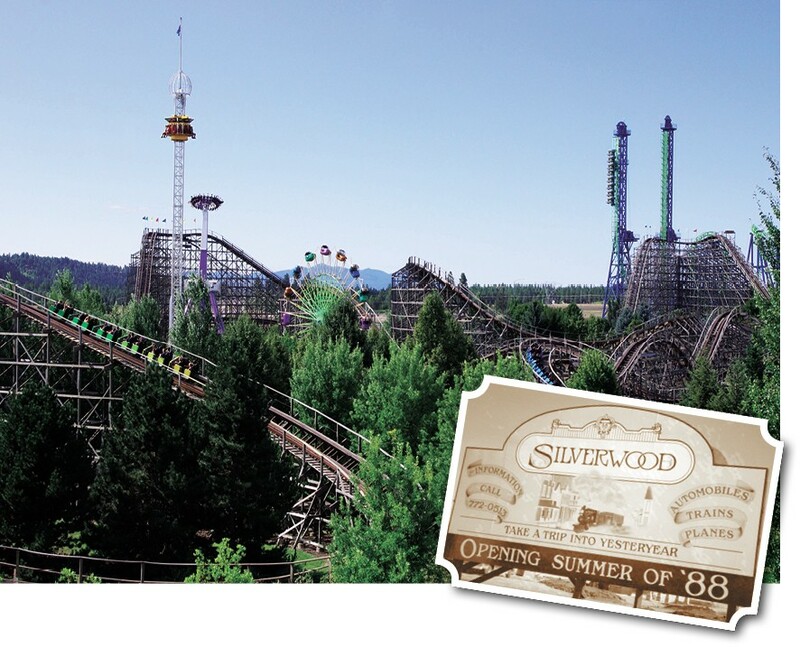 Treat dad to a day of family fun at Silverwood, the Northwest’s largest theme park. Dads get in free with their family. Purchase tickets online or at the gate and let the fun begin.